The Masters will have golfers play in threesomes and go off at 7:30 a.m. ET Sunday to try and avoid inclement weather predicted to hit in the afternoon. AUGUSTA, Ga. — In a rare move, the Masters is moving up its final round tee times and having golfers play in threesomes to try avoid major storms headed into the area. In addition, the tournament announced that players will tee off No. 1 and No. 10 in an attempt to get more golfers on the course before the bad weather arrives. Sunday's action will now begin at 7:30 a.m. ET and the leaders will tee off at 9:20 a.m. ET. CBS will also move up its broadcast to 9 a.m. to televise the action. As of Saturday afternoon, Augusta's forecast calls for storms to enter the area around noon, with isolated thunderstorms predicted until 10 p.m. ET. The Masters leaderboard is jam-packed with some of the game's biggest names—including Tiger Woods—and is setting up for a frantic finish Sunday. 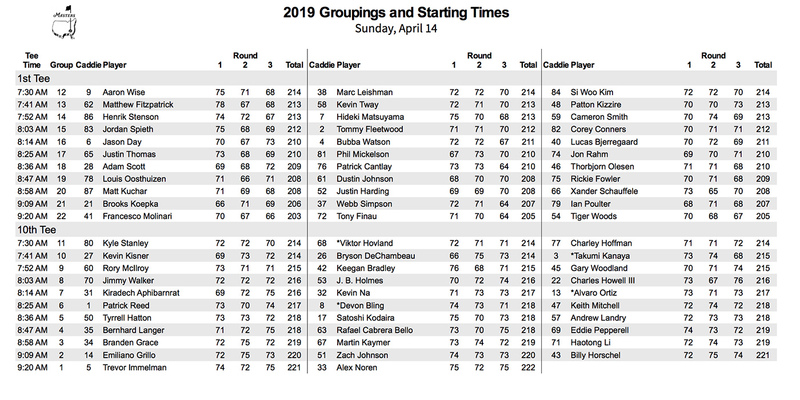 Below are the full tee times.